The small and convenient design of this USB3.0 Flash Drive makes it ideal for storing or transferring homework, presentations, music and video content as well as for high-speed data transfer between digital products or as a convenient and portable backup media. 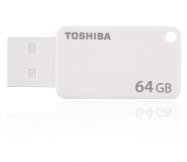 Transfer your video and other large data files with the SuperSpeed 3.0 USB Flash Memory from Toshiba. The new series can transfer content 2 times faster* than with USB2.0! With up to 64GB Capacity, the series offers plenty of space for your documents, videos, photos and music.